My name is Jonathan. I am a window cleaner from Sydney, Australia. I have been washing windows professionally since 1997 (I started young!). I seem to be constantly busy, cleaning residential homes, strata blocks, shop front windows and other small-medium rise commercial buildings. 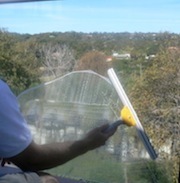 You can contact me on 1300 567 862 if you would like to arrange to have your windows cleaned. I'm often asked about tips on getting a good result. "What's the secret to getting the windows looking so clean?" my clients commonly ask. So, this web page (and the next one on cleaning small windows) answers a lot of those questions - to help both householders and the professionals. To get off to a good start with cleaning your windows, it's important to have good quality equipment. Some of this may be a little more specialised, but you should be able to find it all at a large hardware store, or a cleaning supplies shop - just type "cleaning supplies" into a search engine to find one close to you. Preferably wide enough to fit the squeegee and mop in. This one on the right is great for professionals, but a little over the top for householders. 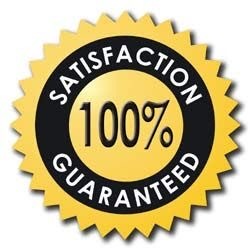 There are huge differences in quality available, and this is probably the most crucial tool of all. So I suggest purchasing a good one, not like the ones you find at petrol stations. Unger, Ettore, Sorbo are recommended brands. Wagtail is also a good brand and it's Australian, but the swivelling handle takes a little more getting used to. I have various sizes from 4 inches to 24 inches, but I use the 14 inch squeegee about 90% of the time. This comes in two pieces: the plastic t-bar and thesleeve. When the sleeve gets dirty, you can detach it from the t-bar and put it in the washing machine. It's usually attached by Velcro or buttons. 14 inches is a good length. The sleeves come in different versions: Porcupine - with little plastic bits throughout it to help scrub off tough marks, Regular, Scourer - with a scouring strip on one side. But my favourite is definitely the Water Retention one. It's handy not to have to return to the bucket so much to dab more water on it. This comes with replaceable metal blades and is useful to get tough marks off, such as paint, varnish or stubborn insect marks. A little one inch, pocket scrapper (as seen to the right) is usually enough for most maintenance jobs, but larger 3 and 6 inch ones that fit onto the end of the pole are good for scraping larger areas. Take care using scrapers on glass! If you don't know the correct methods, you could cause permanent damage! Check point 2 in 'How to do it' below. I hate to be the one that lets the cat out of the bag since there are a lot of window cleaners who jealously guard their secret formula, but I don't see any point in not telling. 'Morning Fresh' and 'Palmolive' are probably the most popular detergents. At the cleaning supplies shop you can spend a lot of money on all kinds of window cleaning detergents. I've tried a lot of them, and seem to always come back to Palmolive (soft on the hands and does a great job). Some people recommend vinegar in warm water. The biggest problem with this is that it doesn't sud up. The suds are important to lubricate the rubber as it passes over the glass, making it a lot easier to turn the squeegee. They also make it easier to see any water marks that need wiping off. In fact, they help to show up areas that need more scrubbing because the pattern of the bubbles separate more where there is a finger mark or some other dirt. This could just be an old towel (old is best as the lint and fluff would have worn away). I usually carry a towel and a micro-fibre cloth. More about how to use them later. I carry a short one that extends. It is 1.5m closed, 2.3m opened. This can be very handy for certain windows - but you need to know how to use it. I also use a 4 section pole that extends to 3 storeys high - though it is nearly impossible to clean accurately at that length. 2 storeys is about the limit for squeegees on a pole (even that is pretty tricky!). I find a three step step-ladder is very useful, and the extension ladder that reaches about 2.5 storeys high - not advised for anyone not confident being at heights. This supports a side bucket and is a good place to easily access your scrapper and rags. This is really just for the professionals. It is a small bucket that hangs down one leg off a belt around the waist. It is a great place to easily stash you mop and squeegee, saving them from dripping all over the place, and also giving you two free hands while walking up the ladder, on the roof etc. Rub the wet mop (that has detergent on it) onto the window. Give it a good rub to make sure all the dirt is lifted. This is the time to scrape any stubborn marks off with the scrapper. If you need to use the scrapper, make sure to only pass the blade in the forward direction, i.e. don't scrape backwards - this could drag the dirt, cement etc across the glass causing scratches. Now get the squeegee ready. Let's assume you're right-handed. Hold the handle of the squeegee in your right hand with your thumb half way between the top and side. When you place it on the glass, you want to have it at the correct angle. To work this out, say the angle when the handle is touching the glass is 0 degrees, and the angle when lifting it off the glass is 90 degrees (with the rubber still on the glass). You want the angle in between those two - about 45 degrees. Try to maintain that angle for the next step. Now you are ready to clean the water off the glass with the squeegee. Start at the top left corner and snake you way down the window. Make sure to go right to the edges. With a little practise, you will be able to manage this with no water marks left in the middle of the window. It is nearly impossible to do a window without having to wipe the edges. Even the pros normally have to do this! That's where the micro-fibre cloth comes in. This is great for getting rid of those water marks anywhere on the glass. Use it dry. You can just put it in the washing machine when it's too wet or dirty. I go through one or two per house, but beginners will normally need a few more. Hint - I generally don't use micro-fiber cloths to wipe along the bottom of the window frame because this is going to dirty it very quickly. Use the towel for that area. If there are any other marks, such as little insect marks or grubby finger marks that didn't quite come off, give it a rub with a clean part of the micro-fibre cloth, or start again with the mop. That's it! Your windows will look fantastic! So there you have the inside knowledge on how to get a perfect finish to your windows. My next free tips page discusses how to approach cleaning small sized windows - French Colonial, Lead lights and Louvers.